Full-length, two piece design fully supports the recoil spring to help the pistol chamber, extract and cycle smoother. Helps prevent spring bind, makes slide takedown fast and simple. Long wearing, shock-resistant head and hardened stainless steel shaft stand up to both competition and duty use. SPECS: Stainless steel. Includes guide rod plug and 5/32" Allen wrench. Full lengde, to stykke design støtter Returfjæren å pistol kammer, trekke ut og syklusen jevnere. Hindrer våren bind, gjør lysbildet takedown rask og enkel. Lenge iført, støtsikkert hodet og herdet stål aksel stå opp til bruk både konkurranse og plikt. Spesifikasjoner: rustfritt stål. 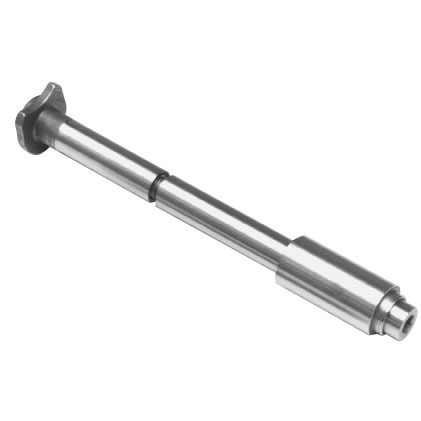 Inkluderer guide rod plug og 5/32" Allen fastnøkkel. Kundevurderinger for Two Piece Guide Rod fits Govt. 5"
Easy to install - needs some work on it to look right, rod to long, sticks out 1/8 inch in front of barrel bushing. THIS IS VERY WELL MADE PART. DROPS RIGHT IN ON TRUE COMMANDERS. JUST MAKE SURE IT'S A 4.25" BARRELED COMMANDER. IF YOUR COMMANDER HAS A 4" BARREL IT WILL OBVIOUSLY BE A LITTLE LONG. I'VE PUT THEM IN COLTS & DAN WESSONS FOR CUSTOMERS & THEY WHERE VERY PLEASED! This is a high quality product. It's sized perfectly for my Colt pistol. I wasn't really looking to upgrade my mil-spec guide rod until I test fired a friends 1911 with this product installed and I was amazed at the difference. Needless to say it is installed in my weapon and it truly tames those +P rounds. I wouldn't recommend firing super hot ammo all the time, but I like to practice with what I intend to use for self defense. I loved this product! I had to grind a little bit of material off of the round section of the back of the guid rod base. It was not letting the base site flush. I have a 2011 Rock Island full size 1911 A1FS GI. It requred some grinding of the round backing in order for it not to get stuck in a position that caued binding. I put it on a 2011 Rock Island 1922 A!FS. I'VE INSTALLED ALOT OF THESE IN CUSTOMERS GUNS. COLT, SPRINGFIELD, KIMBER, DAN WESSON, TAURUS, ETC.. ALL THE BENEFITS OF A 1-PIECE GUIDE ROD BUT MAKES IT MUCH EASIER TO DISASSEMBLE. I'VE NEVER HAD TO GRIND ON 1 OR MODIFIY IN ANY WAY. BEAUTIFUL FINISH, LOOKS LIKE ONE SOLID PIECE UNTIL YOU UNSREW IT. I installed this on my Ruger SR1911 and it was a perfect fit. The OAL was spot on. Very easy to install (if you can field strip your weapon you can install this part)and the included allen wrench actually fits. A bit of a rarity as far as included tools go these days, and it's not a soft steel wrench that rounds off easily. Not that you need a lot of torque on this. The spring cup to guide rod fit is surprisingly tight. Another advantage that is not in the description is a little added muzzle weight. Not enough to be a bother while sighting but helps to reduce muzzle rise just slightly. I also suspect the spring cup to be slightly thicker between the spring and barrel bushing. The new parts went in a little stiffer than the factory parts did. My pistol only had about a box of ammo through it before the upgrade. The only thing I think I'll be doing to improve this part is a bit of polishing. I can feel the spring rub against the guide rod, but if I were more patient I'm sure the parts would smooth themselves out with a few trips to the range. In conclusion I would recommend this as a simple upgrade to any level of 1911 shooter. I'll be ordering more for my other govt' models. Produsentnr. : 889 800732889009 Full lengde, to stykke design støtter Returfjæren å pistol kammer, trekke ut og syklusen jevnere. Hindrer våren bind, gjør lysbildet takedown rask og enkel. Lenge iført, støtsikkert hodet og herdet stål aksel stå opp til bruk både konkurranse og plikt. Two Piece Guide Rod fits Commander 4 1/4"
Produsentnr. : 889C 800732889023 Full lengde, to stykke design støtter Returfjæren å pistol kammer, trekke ut og syklusen jevnere. Hindrer våren bind, gjør lysbildet takedown rask og enkel. Lenge iført, støtsikkert hodet og herdet stål aksel stå opp til bruk både konkurranse og plikt.